PAC Posi-Grip Knobby Soft Plastic Dummies. $3.99. "For the price this dummy exceeded my expectations." For the price this dummy exceeded my expectations. "I can't imagine why anybody would pay more when you can gets these." I can't imagine why anybody would pay more when you can gets these. They are super soft and can be thrown a mile. Great product at a fantastic price! Best price and good quality. For the price I love them. Can buy a bunch of them and don't have to worry when they get tore up. They are made of cheaper plastic, but I'm sure they will last just as long as the other ones. Dogs still retrieve them just like the more expensive ones. Nice to have the ropes already attached. Easy to throw and highly visible. I love these training dummies. They shipped fast and simple. They are an excellent product, and the price cannot be beat. I know I looked around! I will be using Gun Dog Supply for all my training needs from now on. Exactly what I expected. 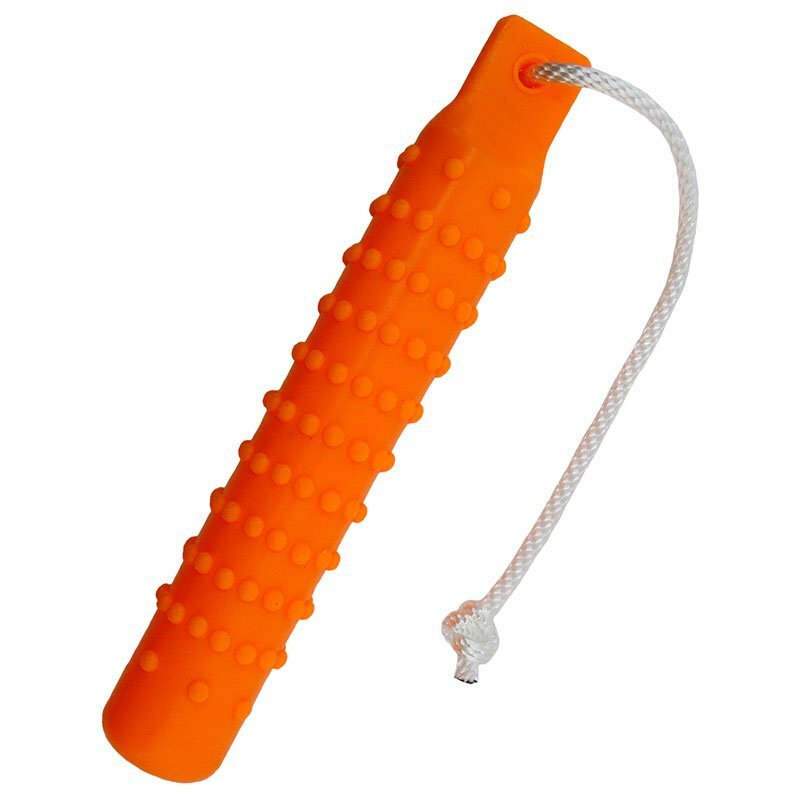 Perfect for practicing water retrieves at a great price. These are a great deal. They do everything I need them to do from t-drills to water marks. Great bumpers and great service as always. Awesome bumper and the price is even better! My dog loves these toys. I went to these for the price due to my dog likes to lose them. Great price! Shipping to ND took a while. I like the dummies. Haven't used them yet, but I can't think of a reason to pay more. I am impressed that for this price they come with a throw rope. These are great little bumpers for all ages and stages! Can't be beat for the price! These are a great deal! They even have the rope on them already, and the entire piece is high quality. Very good for daily bumper work. Great! The web site is great. What you should expect from a cheap bumper! Love them and the price! "Riley lives to play fetch with these." Riley lives to play fetch with these. His favorite thing in the world....Thanks! "Great products here at gundogsupply.com." Bought the soft ones for my Setter. His training has just began. Great products here at gundogsupply.com. Well made soft bumpers. These are good transitional dummies between puppy canvas bumpers and hard plastic bumpers for mature dogs. They are heavier than the canvas bumpers, so they can be thrown farther from the gunner to avoid having your young dog run to the gun on marks,but they are soft for young dogs. Hey Frank Butler, in regards to your review, it's not a chew toy. It is a training tool. The problem you have is with the dog and the trainer, not the product. Get some one to teach you how to properly use an electronic collar and you can stop that chewing in no time. last forever. enjoy the fact they have a small rope already attached. They are perfectly acceptable retrieving dummies. Awesome bumper!! Amazing price... I would compare the quality with some of the industries "BIG" names. If you're training a dog for hunting or field trials. You'll need tons of bumpers. With the quality and price, you can't go wrong with these. "Great products at good prices!" Third round of training bumpers I've ordered from GunDogSuppy.com. Great products at good prices! Highly recommend all the training bumper and Dokkens. Great product, and by far the most inexpensive dummies I could find. "They are just as awesome as the original ones." They are just as awesome as the original ones. I paid $2.00 less for these, and they are exactly the same. These dummies have worked great on land and water. For the price of these you can't get a better dummy. "Good quality for a good price." Good quality for a good price. Shipping was fast. Thanks guys. Gun Dog Supply is the go to for all your Gun Dog Supplies. "These have been perfect for running blinds"
These have been perfect for running blinds, and you cannot beat the cost and customer service!! Nice weight for throwing, and my pup prefers fetching these to 3 inch dummies for now. "Great product, and tough material." Great product, and tough material. My dog loves them. He knows it's working time when they come out. Great for beginners or young dog. Excellent value. Durability seems good so far. I really like these bumpers. The only thing I would change is using a black rope instead of white. Just got them, so far so good. They are very firm, but what we are using them for, they are fine for our program. Good bumper and price. Could be a little softer, but still a good bumper for blinds.
" These bumpers are great for the price." These bumpers are great for the price. The only reason I didn't give them 5 stars is because they're a little soft, but for the price I would certainly buy them again. "Good product for your money." Good product for your money. Works really good for forcing to the pile and running blinds. They are a little too light for throwing long distances. "I love the texture, weight and softness and color (I got the black and white)." I love the texture, weight and softness and color (I got the black and white). I didn't like that there was release valve, so when they are chewed on they stay flat for a while. After a short time of using them the black paint was coming off and the white part is cracking. All that being said for the price they are good, and I'd consider buying them again. BTW the speed of delivery was fantastic! Good dummies for a great price. I'm training numerous dogs right now, and so far they're holding up. Will buy again. These are good for general training but they are soft. May want a harder bumper as an initial trainer to keep a puppy from biting down too hard. Wish it was a little sturdier. They get the job done. Smaller in diameter and do take a funny shape in cooler weather. One was torn when we got it, but they replaced it right away. They are a bit soft, but for the price I am very satisfied. Very close to 5 stars. They appear to be ok, but I have not put them to use yet. That is why I am giving 4 stars. Good for basic drills, that's about it. They work well enough for the price I suppose, but when I think of a soft bumper these were not what I imagined. They feel more like a balloon than a training tool. Little bit too soft. Some of them came squashed flat and not round. Hard for pup to hold when picked up on flat side, it wants to slide out her mouth. It needs just a little more rigidity to them in my opinion. American Water Spaniel. Hunts. Family pet. Bought because I couldn't get the harder ones. This is a lower end of the market bumper, but with the price point I expected that. I use these for pile work only and that was my intent from the moment of purchase. They are too light to throw any distance. They serve the purpose I intended them for. Jim Hodges, Hodges Retrievers Royston,GA. Not as durable as the Avery ones. They are holding up ok. They are real soft and it makes my dogs want to chew them. "I have ordered before, and this one is not as sturdy." I have ordered before, and this one is not as sturdy. But still a great price and great speedy delivery. "Will shatter in cold weather. Otherwise good product." Will shatter in cold weather. Otherwise good product. These are soft. I prefer the more durable, hard dummies. The name details soft, but they did not feel like they would hold up very well. There's no option to blow more air into the bumper. It's very soft. I could squeeze one side to the other. Too soft. Not what I expected. Dog refuses to pick them up. Not very durable. Bought two. One has already been chewed thru at the rope attachment point after just a few times using it. Buy the FIRM knobby dummy instead. 100 times as durable, only 76 cents more. Temporarily sold out of "WH| White". Expected to be back in stock by April, 2019. PAC Top Dog Posi-Grip training dummies are soft plastic with a knobby surface. Available in white, black / white and orange. 10.75"H x 1.75"W.